Essie wants nothing more than to see her dear husband’s vision take the world by storm. In preparation for yet another Fair and Exposition, she has constructed an outfit showcasing elements of the dome home. A light, smooth cotton twill printed with lavender, gold and blue triangles forms the base of her walking suit. Lavender ruffles frame nearly every edge; while they have nothing to do with domes, they helpfully point out that she is a refined and in-fashion lady. Finally, iridescent domes of many sizes adorn Essie’s jacket, skirt, apron, and hat. What a lovely ensemble. Who wouldn’t want to meet her and find out more about Dome Homes? I have long been fascinated by costumes (in fact, I worked at a costume shop in high school). 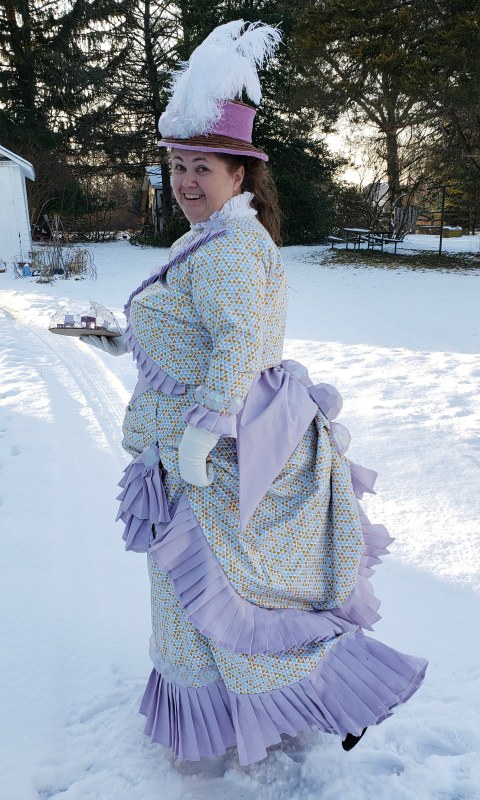 The last few years, I have picked up historical costuming as a hobby. It’s sort of a sewing-just-for-me past time that satisfies my love of history, hand stitching, creative problem solving, and all things gaudy, weird and impractical. I have fallen hard for the historical costuming community and about a year or so ago, I joined Foundations Revealed and Your Wardrobe Unlock’d – a community that focus on costumes, corsetry, and construction of the two. Brainchild of the wonderful Cathy Hay, the community hosts an annual competition. For 2019, the competition theme is Architecture. Initially, I hadn’t planned on entering but I kept thinking about it. So, about 6 months ago, I decided to get to work. I knew I wanted to make a historical costume, of course. And I thought the Gilded Age might be an interesting period to explore since I haven’t done much 19th century sewing. What an amazing Dome Home! I have a habit of falling very deep into researching topics that interest me. To the point that I sometimes never even get around to using the research as intended. I determined that there was no way I could manage in-depth research for a specific sub-period of the Victorian era, plus some architectural inspiration. I decided to go with an architectural phenomenon I had already researched to death: geodesic domes. In art school I was fascinated with the dome shape and spent waaaaay too much time reading about the work of Buckminster Fuller (who was actually born towards the end of the Gilded Age). The Gilded Age had its own architectural phenomenon: the rise of skyscrapers. I imagined a quirky inventor – my imaginary Professor Hanover – determining that skyscrapers would be the fall of Western civilization. His goal was to popularize something completely different. Dome Homes! The perfect antidote to skyscraper envy. The Hanovers would tour the world, attending every exposition, fair and wild west show that would have them. They would proselytize for the bubble-like space. It could satisfy the Victorian sensibility for seeing and being seen. It could house everything from exotic collections to fine furniture. Of course Mrs. Hanover would support her husband’s endeavors, like any dutiful 19th century wife. Her dome home walking suit would broadcast that devotion and attract the attention of many a fine lady and gentleman.